Tavleen Singh, the noted reporter, writer and columnist was a participant in The Inner Way Program conducted at the Isha Yoga Center from 12-16 Jan 2011. An afternoon session with Sadhguru in the Spanda Hall Pavillion. Tavleen Singh, the noted reporter, writer and columnist was a participant in The Inner Way Program conducted at the Isha Yoga Center from 12-16 Jan 2011. Touched and impressed by the wonderful space of the Isha Yoga Center and by Sadhguru's educational initatives - Isha Samskriti and Isha Home School, she shared her experience with The Sentinel Assam. Here's a brief excerpt from her article. He [Sadhguru] has built an institution that is run almost entirely by volunteers who are drawn to the Isha Ashram because they believe that they can contribute their voluntary services to building something unique. Even to someone as spiritually challenged as me, it was hard to come away from Sadhguru’s Ashram without being very impressed with what I saw. 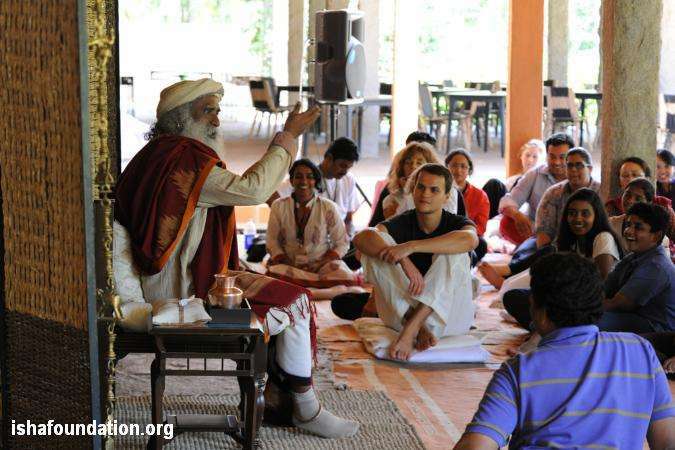 The Inner Way is a rare opportunity to imbibe the timeless science of yoga from Sadhguru. The retreat, held amidst the serene surroundings of Isha Yoga Center at the Velliangiri Foothills in Southern India, offers scientifically structured methods to optimize health and wellbeing on every level.